Nikki Haley claims to have ‘foreseen’ the perpetrators of an upcoming chemical attack in Syria’s Idlib – presumably in a prophetic dream. 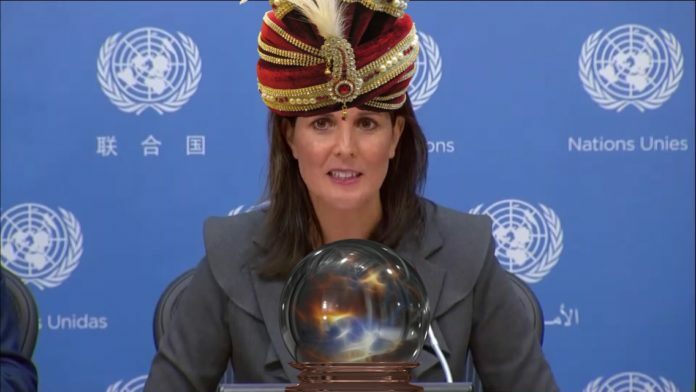 Haley, who is the US envoy to the United Nations, made the prediction amid warnings from Russia that Western-backed terrorist groups were preparing a false flag attack in Syria to trigger a U.S. invasion. Preliminary results from an investigation conducted by the Organization for the Prohibition of Chemical Weapons (OPCW) found no traces of any nerve agent at the scene of the alleged Douma attack, contradicting theories pushed both by the US government and the media that Damascus had used military-grade chemicals against the civilian population. The international investigative body did however identify several widely available commercial chlorine compounds at the site, but none were “CWC-scheduled chemicals,”meaning nothing found was banned under the Chemical Weapons Convention.